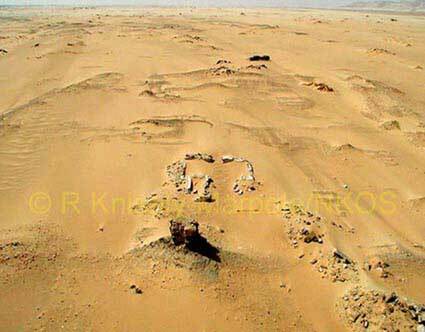 The outline of Ain el-Tarakwa is barely visible on the ground, since the archaeological remains lie deeply buried under metres of sand. As Ain el-Dabashiya, the site is virtually unknown and has never been investigated before. It appears to consist of the well-preserved remains of a small sandstone temple, surrounded by a rectangular enclosure wall packed with rooms. Abundant pottery and surface finds indicate that the site was once inhabited by busy little community.